A1 Jasper's Kennel & Run: The A1 Jasper's Kennel & Run is a great solution for keeping your dog outside; especially if you wish to keep it away from the distractions of the home. 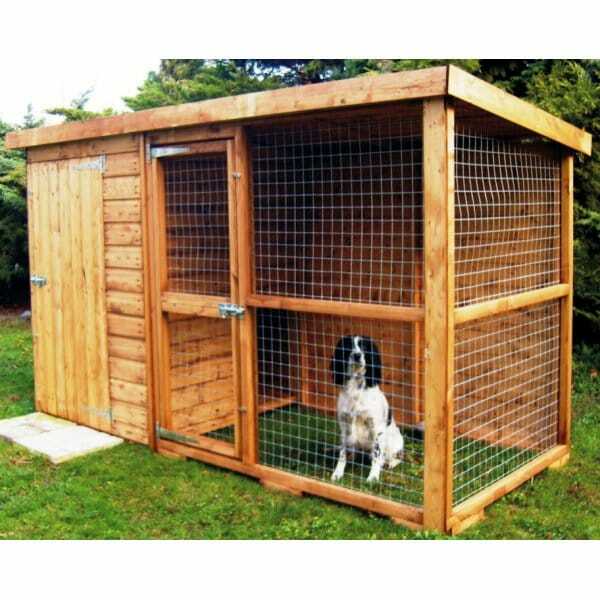 The small opening between the run and the kennel allows your dog to move between the two with comfort and easse. The access door for owner is fitted with pad bolts so you can fit your own security devices of choice. The run is built from sturdy timber framing and finished with wire mesh. The back wall of the run provides some protection against wind and rain, the slanted roof is also a space saving design element and won't interfere with any views. A neat and tidy solution for keeping your beloved pet outside in comfort. It is suggested to buy the largest size possible for your budget to allow as much space possible for your animal.